A large crowd descended on MBTA headquarters in downtown Boston on Monday as IAM Local 264 transit mechanics rallied with allies to defend taxpayers, workers and riders against the latest MBTA privatization scheme. The MBTA mechanics were joined by community allies and elected leaders, including State Sen. Marc Pacheco and State Reps. Mike Connolly and Michelle DuBois, and multiple rider coalitions. They were all speaking out against a for-profit privatization scheme aimed at outsourcing core MBTA bus maintenance services. 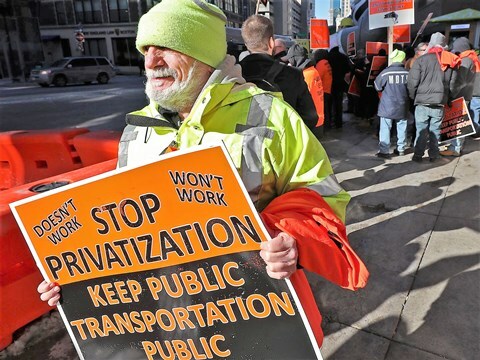 “Giving up control of public transit to for-profit corporations has been a very bad deal for Massachusetts taxpayers, workers and riders,” said Michael Haywood, a mechanic and IAM Local 264 shop steward at Boston’s Arlington Avenue garage. Haywood has 11 years of experience repairing MBTA fleet vehicles. Despite a diverse and aging fleet of buses, federal data shows MBTA mechanics are the best performing in the nation. The latest available data indicates MBTA buses travel an average of 12,964 miles between breakdowns, more than 6,000 miles than the next best competitor. In fact, the invention of an MBTA mechanic and IAM 264 member is credited as playing the key role in improved winter performance by the MBTA this year. Public transit advocates warn that losing this kind of ingenuity and experience to outsourcing could destabilize the MBTA bus system. Since the MBTA allowed for-profit Keolis to take control of public commuter rail services, the results for riders and taxpayers have been disastrous. Millions have been spent to bail out the for-profit company after they underbid their contract. Even privatization proponents acknowledge that the largest and most critical privatization effort by the MBTA so far has been a massive failure. Data shows that Keolis continues to struggle with providing on-time service, despite the bailouts. Meanwhile, other key outsourcing contracts, including with S.J. Services, ABM Industries, and the Maine Military Authority  have also been dramatically underbid. Results of the underbidding have included major repair delays to key MBTA fleet vehicles and attempts by janitorial contractors to rip health insurance coverage away from workers. More than 450 mechanics, fuelers, and other skilled professionals united in IAM Local 264 proudly contribute to the operation of the MBTA and to our communities every day. We believe in ensuring safety for our riders and in professionally negotiating contracts that guarantee our members have a say in their job and can perform those jobs in workplaces that are safe. The Machinists Union and Local 264 have been fighting for workers, their families and Boston communities for over 120 years.